A unique copy of an otherwise not uncommon book. A magnificent contemporary full calf binding with a crosshatch pattern and the boards panelled in gilt; gilt corner pieces within a single gilt filet, surrounded along the edges by gilt stamped floral rolls within double gilt filets with four corner pieces. Gilt dentelles and inner-dentelles. The spine divided in seven compartments by six gilt decorated raised bands with double gilt filets at either side and with the title on a black morocco label in the second compartment. The other compartments gilt tooled within triple gilt filets with corner pieces. All edges marbled. 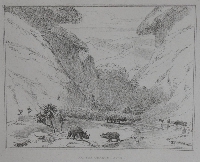 Some leaves watermarked " J. Whatman / Turkey Mills / 1819 ". Grey pastedowns and flyleaves with the bookplate of G.R. Nicolaus (¹) on the front pastedown. Collation: 2 preliminary blanks, half title, title, dedication page, editor's foreword, contents leaf, followed by 48 plates printed on India paper, each print followed by a leaf with descriptive letterpress, 2 trailing blanks. 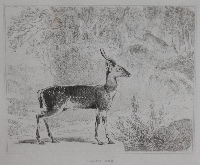 The plates are soft-grounded etchings and have all been engraved by Samuels brother William, while the accompanying text was written either by Mr. John Barrow or Dr. William Somerville. Minor soiling to the boards, light rubbing to extremities, light foxing to the mounts of a few plates, the corners of just a very few mounts creased, but overall a clean and attractive copy of a very special book. An extremely rare, exceptional copy, both in size, completeness and with regard to the title page. He concludes that only the VAM copy is a large paper copy. 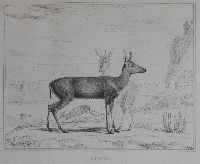 In the VAM copy the plates are printed on India paper, as in a few other copies, while, as auction records prove, most copies were printed on plain paper, the cheapest variant (£ 3. 3s) published, according to Abbey. The prices of the other issues were respectively £ 4. 4s for the copies with the plates printed on India paper and £ 8. 8s for the large paper issue with the plates on India paper as well. Neither in ABPC nor in RBH there is a record for a large paper copy, regardless the format. The size of our copy is 16 ⅓ x 12 ⅔ inch (415 x 322 mm), so it almost matches the size of the VAM copy, however, unlike the VAM copy it is not in oblong format. Abbey also mentions that the title page of the upright format differs slightly from the oblong format; it makes and Scenery a separate line. 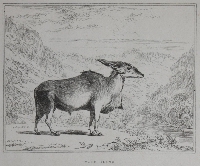 In our copy, however, and Scenery is part of the line reading the Native Tribes, Animals, and Scenery, so it matches the line on the title page of the copies in oblong format. It seems that a copy in this size and format was unknown up till now. If you have any additional information about this size or if you have any knowledge about more such copies, then we would highly appreciate your feedback. Samuel died in Ceylon in 1811. His brother obtained the drawings and decided to have them published. 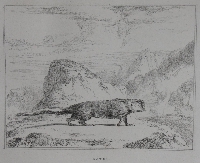 Abbey: "Of his choice of soft-ground etching for the reproduction of his brother's drawings William says he has merely to add with respect to the Engravings, that he has endeavoured to transfuse into them the spirit of the originals by a process which appeared to him best calculated for the attainment of that object. It is a most beautiful and sensitive work. One can well believe that William has not intruded himself but has indeed kept the spirit of the originals." Abbey Travel 326, Gay 3136, Hosken p. 55, Mendelssohn I, pp. 412, 413. (¹) G.R. Nicolaus was a partner in the London based firm of Mercer, Nicolaus, and Co., a firm specialized in worldwide geological surveys for metals, fossil fuels and the like. He also was a great bibliophile. (²) A librarian of he Victoria and Albert Museum kindly has informed us that the exact size of this volume is 335 x 420 mm or 13.2 x 16.5 inches, so even slightly larger in height than Abbey mentions and in oblong format indeed.